SAN JUAN, Puerto Rico — José Román Morales is an energy commissioner, which is usually a comfortable and unremarkable post. But not in Puerto Rico after Hurricane Maria. Here, being on the energy commission is a fight for survival. Román oversees an electric utility that regularly flouts the commission's orders. And the utility is backed by a powerful federal board that also ignores those orders. The governor and Legislature, for their parts, are intent on wiping the Puerto Rico Energy Commission off the map. "What's going on is so constant and daily that you have to keep growing and adapting, and adapting and adapting and overcoming. It's shock after shock after shock," said Román, 45, whose soft-spoken and polite demeanor belies how much he's been struggling. "There is no time to reflect." This chaos engulfs the energy commission as it, and all Puerto Ricans, faces a transition with extremely high stakes. The territory's power company, the Puerto Rico Electric Power Authority (PREPA), is about to be privatized after 70 years as the island's sole power provider. What worries Román is that the commonwealth's government is approaching the massive undertaking in haste and with few safeguards in place, which it has done before, sometimes with disastrous results. It's possible it will all work out. After the devastation of Hurricane Maria, PREPA is under a microscope, and a huge complement of experts and heavyweights are on hand to help. But the obstacles are so big that privatization will be difficult to do right. That's because the world has never seen circumstances like Puerto Rico's. There have been bankruptcies. There has been upheaval in its regulatory regime. There have been technology transformations. There have been natural catastrophes. But there's never been a case where all of these, plus privatization, have happened at the same time. Puerto Rico is desperate. More than seven months after Maria blew through and destroyed the electric grid, it is still limping, and blackouts are common. More than 30,000 customers haven't gotten their power back. Economic stability won't return unless electricity becomes reliable, hurricane-proof and affordable. Since Hurricane Maria, there have been flashes of optimism about what a successful grid recovery could mean for Puerto Rico and the world. After all, it's not every day that a grid that has been demolished has an opportunity to start again. What if Puerto Rico made solar energy from its abundant sunshine and combined it with batteries and natural gas power plants? What if it built microgrids, which could allow crucial services and factories to keep running even if a hurricane hit? This could be a new grid model for islands and remote communities everywhere. A December, a group of utility heavy hitters wrote a report, called "Build Back Better," that identified Puerto Rico's situation as "an unprecedented opportunity to rebuild and transform the system to one that is hardened, smarter, more efficient, cleaner, and less dependent on fossil fuel imports." To make the task even more urgent, the electric grid was in terrible shape even before the hurricane's coup de grace. Puerto Rico suffered from longer and more frequent blackouts than almost anywhere on the mainland, with sky-high electricity rates. PREPA was $9 billion in debt after years of unsustainable borrowing. Over the last five years, 30 percent of its employees have left. The "Build Back Better" report put a price tag on what it would take to turn the grid around: $17.6 billion. In March, Puerto Rico Gov. Ricardo Rosselló made an announcement. His government would do what government often does when public infrastructure is beyond repair: cede control of PREPA and invite private dollars to rebuild it. PREPA's monopoly would end, the generation plants would be sold off, and the transmission and distribution network would be operated on a long-term concession of up to 25 years. The Legislature took up a bill to enable it called the "Puerto Rico Electrical System Transformation Act," which is undergoing hearings. "We are very optimistic that this process will result in us being able to transform the energy system in Puerto Rico," said Carlos Mercader, head of the Puerto Rico Federal Affairs Administration, which represents the territorial government to Washington, D.C.
"The bill establishes a mechanism to sell PREPA's assets via politically driven contracts — rich in fees for lawyers, accountants, consultants and advisors," wrote the authors of a report by the Institute for Energy Economics and Financial Analysis (IEEFA). The Legislature's blueprint doesn't address the basic problems that drove PREPA into a ditch, including political meddling, IEEFA wrote. "There's no coherent plan toward moving toward new renewables or retiring plants to deal with declining demand," one of the report's authors, Cathy Kunkel, said in an interview. Others have pointed to Puerto Rico's last privatization of a key utility as an example of what can go wrong. In the early 1990s, the island's water agency, the Puerto Rico Aqueduct and Sewer Authority (PRASA), was in the same sort of shape PREPA is in now: saddled with debt and decrepit, unable to meet customers' needs. Privatization of PRASA was set in motion by Gov. Pedro Rosselló, the father of the current governor. A study from the University of Iowa explains what happened. In its haste to close the deal, Puerto Rico sought few bids and wrote contracts poorly. Cost overruns ensued, along with conflicts that led to master contracts being canceled not just once, but twice. But there are reasons to think that history won't repeat itself. The dramatic events of the hurricane have brought PREPA into the mainland's sights like never before. An extraordinary assemblage of outside experts are trying to guide it. In March, Walter Higgins, a veteran utility leader, was named the first CEO of PREPA not appointed by the governor Energywire, March 21). He joined Todd Filsinger, another industry vet and a specialist in corporate restructuring, who was made chief financial officer. They were chosen by PREPA's board, which in the last year has been stocked with industry professionals. On top of that is an 11-member advisory council of energy executives that was formed in December. Together they are the most experienced contingent the utility has ever seen. And it doesn't end there. On the privatization question, the U.S. Department of Energy has made a $850,000 award "to develop a policy and legal framework to provide a regulatory process for privatization," as Bruce Walker, assistant secretary of electricity delivery and energy reliability, told a House subcommittee last month. That plan has PREPA in coordination with the Southern States Energy Board, which is a compact among the governors of 16 Southern states plus the U.S. Virgin Islands and Puerto Rico. "There's a team addressing all the matters that really need to be taken care of," said Mercader, the Puerto Rico representative in Washington. "They're doing it in a way that has never been done for PREPA." Finally, there's the Financial Oversight and Management Board (FOMB), which Congress created well before the hurricane to restructure Puerto Rico's $70 billion municipal debt, including PREPA. Part of the difficulty for PREPA and the energy commission is that answering to so many outsiders is time-consuming. Tomorrow, both Higgins and Román will testify on grid questions before the Senate Energy and Natural Resources Committee. Uphill climb or brick wall? Even the most zealous and competent team will face enormous obstacles figuring out how to do billions of dollars of upgrades without stifling the economy. The central problem is electricity rates. They affect every homeowner, business and factory, as well as the money available to rebuild the grid. PREPA currently charges a bit more than 20 cents per kilowatt-hour for residential electricity, far more than utilities charge on the mainland. That takes a toll in Puerto Rico, whose residents have far lower incomes than residents of any U.S. state. Last month, PREPA issued a new fiscal plan with an aspirational rate goal. As a sign of how big the challenge is, its target wasn't to lower prices, but to keep them where they are — to have residents still pay about 20 cents per kWh in 2023. Debt: Servicing the utility's debt, even partially, will jack up electricity rates, according to PREPA's plan. Depending on how much is set aside, rates would rise to between 25 and 28 cents per kWh by 2020 and keep rising for the next 30 years. But the Puerto Rico Legislature's privatization bill is silent on PREPA's $9 billion debt. Asked how the government would address it, Mercader referred to FOMB and the courts. "The end result will be in the hands of a judge of how the debt will be serviced," he said. The debt is likely to haunt Puerto Rico and its ratepayers. 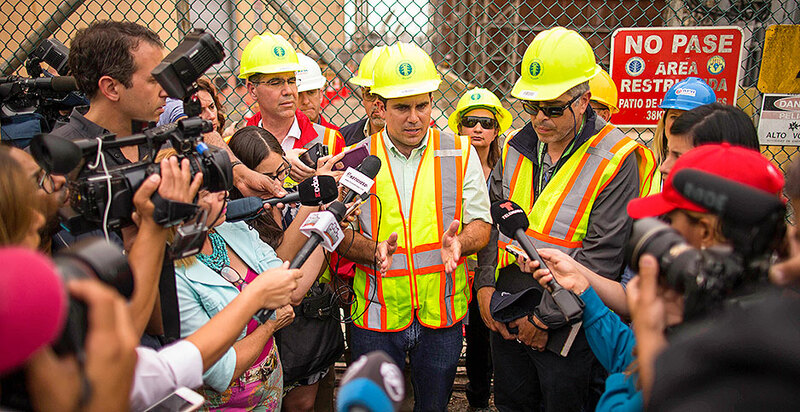 PREPA's checkered history leaves it with scant trust among energy investors. Earlier this decade, PREPA signed contracts for 2.2 gigawatts of renewable energy projects — nearly all of which subsequently collapsed because PREPA issued vague rules and rushed the process (Greenwire, May 2, 2016). With the territory's track record of not paying debts and reneging on deals, it is likely that any company investing billions to improve Puerto Rico's electric grid will insist on repayment from ratepayers — in the form of higher rates. Pensions: As its financial situation worsened, PREPA has starved its pension funds, which employees draw on in retirement. Unfunded obligations now total more than $3.6 billion. It's possible that cutting those benefits could make investing in the grid more attractive. FOMB has required such austerity measures across the government, such as cutting Christmas bonuses. But in a troubling sign for investment, Rosselló and the Legislature have flatly refused to abide by them, and the issue has been punted to the courts. Dropping demand: Whatever private companies invest in Puerto Rico will sell fewer electrons than PREPA did. During a decadelong recession, electricity demand has dropped 18 percent. That is poised to accelerate: With hundreds of thousands having migrated off the island after the hurricane, the territorial government estimates the population will drop an additional 11 percent in five years. Meanwhile, the load — the amount of electricity used — is expected to drop even faster, by 21 percent, with the assumption that replacing the island's old grid will lead to gains in efficiency. Electricity giveaways: One reason PREPA is in dire financial straits is that it has long given electricity for free or at a discount to municipal governments, low-income housing and hotels. It spends 8 percent of its operating budget on these subsidies, compared with 5.6 percent for publicly owned utilities on the mainland. A private operator would be motivated to end such subsidies. The government has taken some steps to lower them, but going further will be politically costly. Mayors of the territory's 78 municipalities are pushing back, complaining that their meager budgets can little afford the $260 million in bills that privatization would bring, according to the Puerto Rican daily El Nuevo Día. Microgrids and solar: Any day now, Román's commission will announce new rules for microgrids — local energy networks that could generate their own power but use public lines. The rules are hard to draft because no one has ever tried to build an island grid with dozens or hundreds of microgrids. They could be a game-changer for future hurricanes by allowing users like water treatment plants or factories to keep operating even if the larger grid goes offline. But for any company planting a financial stake, it's unclear how many customers remain to be served. Along with rooftop solar and batteries — two other technologies that are surging after the hurricane — how much power will come from central power plants? How will the grid be configured? No one knows. A utility commission sets electricity rates so investors get a return and users aren't fleeced. It oversees a long-term strategy, called an integrated resource plan, that details how the utility will deliver power, what resources it will use and how it will pay for them. Privatization is an especially critical time to have a regulator on duty. But in Puerto Rico, as the Legislature moves to privatize PREPA, it is also dissolving Román's agency, the Puerto Rico Energy Commission. Citing $74 million in budget savings, Gov. Rosselló proposed combining the regulators for roads, telecommunications and energy into a single public service commission. Critics say the governor's real motivation is to wipe the slate clean and handpick the new commissioners. PREPA is one of the territory's largest public employers. That means that during the time it takes to privatize, estimated to be at least 18 months, Puerto Rico may be between regulators or with a new commission that has barely stood up. Contracts worth billions of dollars will establish what Puerto Ricans will pay for power for decades. "That opens the door to a lot of irregularities," Román said. "I'm not saying it's going to happen," he added, "but you're creating the environment where it can happen." The Legislature expects privatization to be carried out by PREPA and the Puerto Rico Public-Private Partnerships Authority, also known as P3, which managed privatizations of the airport and two highways. A majority of the boards of both PREPA and P3 are chosen by the governor. Meanwhile, the energy commission is in a legal fight with FOMB, which also has a statutory role to oversee PREPA. Last year, the commission issued its first-ever ruling on the rates PREPA can charge. After the Whitefish debacle, when PREPA contracted an inexperienced company to do $300 million in transmission grid repairs, it ordered all of PREPA's large contracts to get commission approval. PREPA refused to comply with both, claiming it was already answerable to FOMB. Since then, the energy commission has ordered PREPA to get its fiscal plan approved by the commission before going to FOMB, an order that PREPA also disregarded. Neither the commission nor FOMB is backing down. The two agencies are in a stalemate, awaiting rulings from a bankruptcy judge. The ironic thing for some observers is that the energy commission is one of the best-run and most rigorous agencies on the island. "They've done a very thorough job. They're extremely professional, one of the most professional things I've seen out of the Puerto Rico government in the last six years," said Cate Long, who runs a research service about Puerto Rico's debt. Dissolving the commission, she added, is "a disaster, in my view." The commission's thoroughness is surprising because it was created only in 2014, as the first-ever regulator of PREPA. Román serves as interim president of the three-member commission, after its president abruptly resigned last year. 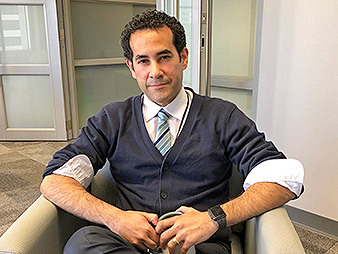 A Puerto Rican native who studied power systems at Rensselaer Polytechnic Institute, Román was designing efficient buildings in New York City when he got an offer out of the blue to serve on the commission. He was installed as one of the very first commissioners. And when his term ends on May 27, he may be one of its last. How the new grid is built is "the opportunity to have a real transformation of Puerto Rico, and something to be proud of for years to come, and something you can tell your children that 'we did that,'" he said. "Or," he went on, "you do exactly more of the same, and you force long-term contracts with companies, and you set Puerto Rico up for something worse for 20 to 25 years."